Free acidity (measured as oleic acid) below 0,8% with no organoleptic defects.This is the best Olive Oil you can buy. But beware, just like you get better and poorer wines – not all Extra Virgin Olive Oils are equal. Free acidity (measured as oleic acid) above 3.3% but is not fit for consumption. Obtained from virgin olive oil (such as Lampante) by refining methods which do not lead to alterations in the initial glyceride structure. This oil is often called Pure Olive Oil. Consists of a blend of virgin olive oil fit for consumption (not Lampante) and refined olive oil. Formerly known as olive residue oil. This is oil which is produced by chemically treating the press-cake after initial pressing to extract remaining oil. This crude oil can then be further refined chemically to reduce acidity and it is often blended with virgin olive oil to restore some colour and flavour. The colour of the oil is not really a good indicator of the quality, but rather of when the fruit were harvested. Early in the season the oil of most cultivars tends to be a darker green and later in the season it is more yellow. If properly stored, olive oil keeps longer than other edible cooking oils. 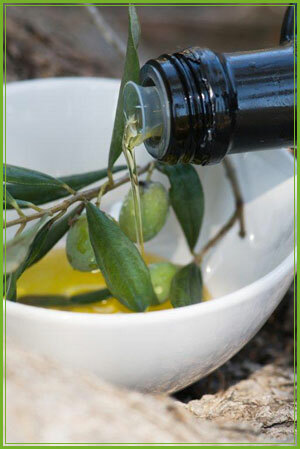 Olive oil will stay fresh longest if it is kept in an airtight glass container, in a cool cupboard. It should never be kept in the fridge, as it will become thick and cloudy. If this happens, remove form the fridge and it will return to normal. an airtight glass container, in a cool cupboard. It should never be kept in the fridge, as it will become thick and cloudy. If this happens, remove form the fridge and it will return to normal.